A primary issue for those in recovery is the inability to find peace without the use of alcohol or other substances; coloring calms the mind and helps you de-stress. Coloring is meditative--it allows you to stop overthinking and to simply "be" in the moment. Many children who grew up in chaotic alcoholic homes missed out on the simple creative pleasures of childhood, like coloring; this allows anyone to explore their playful, creative sides. Once free of addictive substances, people often experience a tremendous void--a new hobby like coloring can help fill the void in a healthy way and spark interest in other artistic avenues. For people who struggle with negative self-talk or the need to be perfect, coloring is great because there are no rules! It's an artistic activity that requires no skill set or mastery--it's just fun. You'll find original art with diverse imagery, from mandalas and meditative patterns to nature scenes, animals, and mantras with room to create custom patterns and doodles. Encouraging quotes and affirmations will help quiet negative thoughts and a "how-to" to section by illustrator and artist Judith Clement Wall guides readers in how to customize the art or to take their interest further by doodling or patterning within the pages. We've even included blank journal pages for self-expression. Thick stock paper allows readers to use colored pencils, markers, or watercolors. Pages are perforated for easy tearing and sharing, to frame or hang on the fridge. We've also used "lay-flat" binding to manufacture the book which eliminates that annoying bulge in the spine when you open a book. Life is a canvas and we are the artist; it's up to us to paint a beautiful picture. Congratulations on taking the bold steps to make your life the best that it can be. Making the commitment to living a healthy life is exciting as you grow into the person you were meant to be, whether it's your first month in recovery or your first-year anniversary. But recovery doesn't only mean becoming free from a substance; recovery means finding a way of living that works: physically, mentally, emotionally, and spiritually. With each new day, you are discovering new strengths and gifts and exploring life-affirming ways of finding joy and well-being. Living free of any addiction means you are no longer dulled by a substance or constrained by a behavior—you are seeing life through a crystal-clear lens, in all of its brilliance and richness. Just like looking into a kaleidoscope of blending colors, you might feel a mix of emotions together—intense joy with pain, vulnerability with excitement, loneliness with connection, and uncertainty with possibilities. Coloring can quiet your mind, calm your thoughts, and allow you to simply be. Sometimes the silent moments can be the loudest, and coloring can help you fill the silence by putting pen to paper. As children, some of us grew up in families where we couldn't relax or express our creativity. But expressing ourselves creatively is good for the soul. It allows us to play and to reconnect with the part of ourselves that is pure joy. And the best part about coloring? There are no rules or wrong ways to do it. Some people just like to get lost in the rhythm while others like to customize the art with patterns or doodles. By getting into the habit of coloring each day, you carve out time for yourself, tap into your creative energy, and remind yourself that you are important. Taking time to honor the creative side of ourselves is not selfish or silly—it's self-care! You can color in the morning and focus on creating a specific thought or mind-set for the day or end your day as a way to unwind and reflect on the new patterns that you are creating in your own life. We've included original artwork that we hope will inspire you: mandalas, nature scenes, and animals, as well as powerful affirmations to encourage you. Affirmations are positive statements about the way we want to think, feel, and behave. By reading them aloud and focusing on the words, you help to paint a mental portrait of what you want to become. The messages we give ourselves are the most important messages we hear. What we choose to believe will ultimately rule our world. You can read the affirmations aloud or to yourself, you can think about them as you color, or you can just color without thinking about anything at all. Inspired by the principles of the Twelve Steps, these mantras reflect how you are mindfully living each day and the philosophies you are putting into practice with every choice you make. With powerful themes of honesty, surrender, integrity, forgiveness, perseverance, courage, and more, let these be daily reminders of your commitment to living your life one day at a time, giving space to the creative spirit that lives within you. Just like the blank spaces in this book, every day is a blank slate from which to begin anew. The art you create will be unique to you, just like the journey you're making is yours alone, so go ahead and make your mark! We wish you a joyful and enlightening exploration. The word mandala means 'sacred circle' in Sanskrit. Both Tibetan Buddhist monks and Native American Indians used mandalas as a way of evoking spiritual energy, meditation, and healing. Circles symbolize wholeness, unity, and the cycle of life, and appear in nature as flowers, snowflakes, the sun, the moon, and more. Research has shown that creating and coloring mandalas can relieve stress, reduce anxiety, and calm your mind. Each mandala was specifically designed to help you focus your energy inward and inspire a sense of tranquility. At the end of the book, we invite you to create your own mandala using the instructions as your guide. Markers and gel pens are great for adding bold, defined bursts of color. Markers are best for filling in larger spaces while gel pens allow you to color smaller areas or doodle in tiny details of your own. Colored pencils are perfect for adding shading or for blending two colors together, both of which add interest and depth to any design. TIP: Use scrap paper to test when you blend colors to make sure the final result is what you envisioned. While the paper in this book is designed not to bleed through, by adding a piece of scrap paper under each page as you color, you guarantee no bleed-through. 2. Pick a medium (markers, colored pencils, gel pens—whatever you like). I created every illustration with that third instruction in mind because what's the point of a coloring book if you can't have fun with it? Each page is filled with details which you can approach in many different ways. You can individually color each tiny shape, or you can group them together into bigger sections, which all come together to form the whole. You can leave parts blank for little pops of white space, experiment with color combinations, and play with different palettes, tones, and hues. Each page is designed to stir your imagination, and really, the possibilities are endless. The right way to use this coloring book is YOUR way, and I encourage you to relax, have fun, and enjoy the creative process! ©2016 HCI Books. All rights reserved. 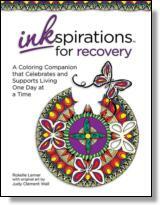 Reprinted from Inkspirations for Recovery: A Coloring Companion that Celebrates and Supports Living One Day at a Time. No part of this publication may be reproduced, stored in a retrieval system or transmitted in any form or by any means, without the written permission of the publisher. Publisher: Health Communications, Inc., 3201 SW 15th Street, Deerfield Beach, FL 33442.